There are so many beading tools available for glass beaded jewelry making it can be very confusing for the beginner to know where to start. You don't need a large tool kit for home jewelry making. You need some pliers and cutters to start with and you can add other tools as you progress. Firstly we will start with pliers and their uses. Round Nose - As the name suggests; the jaws taper to a small round point. Used in beaded jewelry making to form loops, hold small components, close jumprings etc. The round nose will be the most versatile set of pliers you purchase for glass fashion jewelry making. 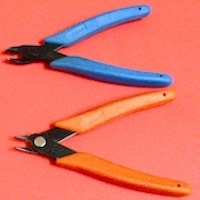 You will find these pliers are excellent for a number of beaded glass jewelry techniques. Chain Nose – These pliers taper towards a flat end. Used for gripping or to bend angles in narrow areas, bending wire, or where tight precision work is required. Flat Nose – Wire or sheet can be bent at angles, and to close jumprings. Good strong gripping pliers. Flat smooth jaws hold pieces without marring. Bent Nose – Just like chain nose pliers, but with a bent tip. Designed to give better access to those hard to reach places. Long Round Nose - Though not essential allow you to make larger loops and are very useful for making clasps. As you will use all or some of these pliers frequently for jewelry making you should purchase the best you can afford. Cushion grip pliers are my favorites. 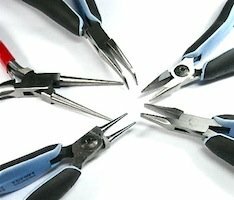 Side-Cutters – Light weight sidecutters can be used for cutting wire and beading cord. Use heavy duty cutters only to cut memory wire. Felt Pad - A 14 x 12 inch felt or soft foam pad makes an ideal working surface glass jewelry making. A pad will protect and prevent beads from rolling around & hopefully, stop them bouncing onto the floor when they are dropped. Bead Reamer - A bead reamer is used to clean up and enlarge glass bead holes. The reamer tips are diamond coated and come in a variety of shapes. Adhesives - There are a number of adhesives you can use for glass jewelry making. Two part epoxy resin is very strong and will meet most of your needs. E6000 is a general purpose industrial strength glue which has long been a favorite of home jewelry makers. Tweezers - Always useful. Great for picking up small beads and using to move beads around whilst you're working. Scissors - There is a need for scissors to carry out a multitude of beading tasks. Necklace Layout Board- Also known as a bead board it has a number of compartments to hold beads and measuring scales around it so that you can layout bracelets and necklaces. Crimping Pliers - These pliers have small grooves in the jaws to hold crimp beads which are used to finish off the ends of necklaces and bracelets. This is not an essential beading tool as crimps can be flattened with chain nose pliers. Ruler - A ruler or tape measure will come in very handy. Choose one which has both inches and millimeters. Storage - Divided plastic containers come in handy for holding your beads. Craft and bead stores sell these and you can probably buy suitable ones at your local hardware store.